Toby Knapp: Fastest Gun in the West! I know that's a cheesy title. Toby's probably groaning, "Oh God!". In my never ending quest for musicians who break the stereotypes, I just have to include Toby Knapp from Sheridan, Wyoming-- population: 16K; a sleepy little cowboy town out in the wide open wild West. The entire population of Wyoming is less than 500K, and it's a big state. Alright, enough geography. Toby Knapp is not a Country musician or even a Southern Rock player, as one might expect from these geographical roots. 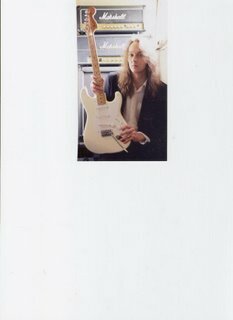 Toby is a Metal virtuoso along the lines of Malmsteen, MacAlpine, etc.!! Yep, while Toby's peers were out shootin' coyotees, slammin' down cases of Coors and pullin' it for the rodeo queens, TK was woodsheddin' the classics and drillin' chromatic scales. Yee Haw!!! We're not talkin' newcomer either; Toby was on Mike Varney's Shrapnel roster and featured in Guitar Player Magazine by the mid-90's. Unfortunately, times haven't been so kind to the Metal virtuoso's out there in an industry that favors Rappers, Boy Bands and Blonde females who can't sing without software. But Toby, and other similar players are still carving out their niche, finding their audience and playing a style of music that requires serious technical skill and knowledge of music history-- not simply bling and software. Toby plays all the instruments in the studio and hires extra gunslingers for live performance. Toby Knapp is currently a metalbolicrecords.com artist. Metalbolic Records is seeking SERIOUS Metal Professionals.